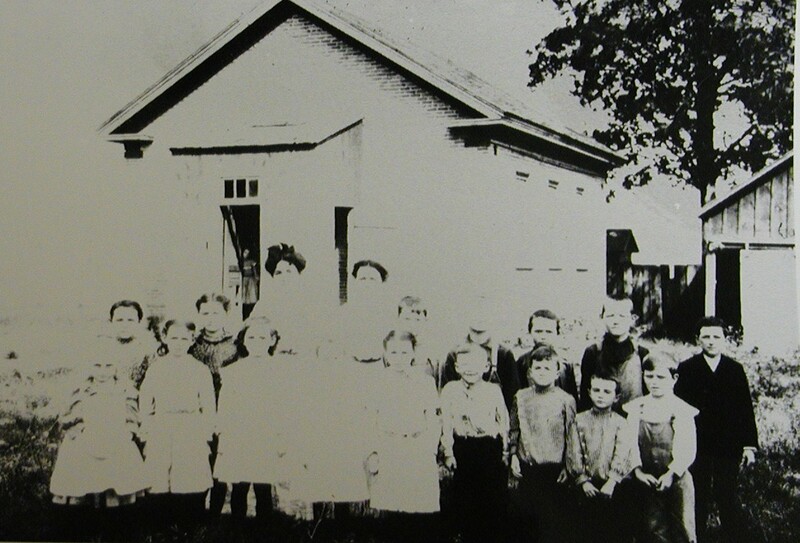 Pittsfield Township Historical Society :: Sutherland School (Second), 1880-?? Location: 900 Textile Rd., its original location, across the road from historic Sutherland-Wilson Farm. Note: This account was written by the students attending Sutherland School during 1941-1942 (and deposited in the Bentley Historical Library). The material for our school history has been compiled by visiting the homes of the older people and people who went to school here. We also derived information from a Historical Atlas of Washtenaw County, Michigan 1874, a History of Washtenaw County, Michigan (1881), and the record book of early school meetings. Sutherland school is located in Section 12 Pittsfield Township, and District Number five. It was named for Langford Sutherland, a man who owned about six hundred fifty acres of land which was divided into smaller farms. He owned the most land and lived right across the road from the school. John Cody donated the land, which he had bought from the government, for the school. On this land a bee composed of the men of the community erected a log building which stood sixty feet west and a little south of the present location. The present building was erected in 1880 by carpenters and masons hired by the school district. It is valued at eight hundred dollars. 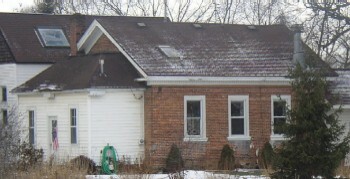 It is a brick building with a wood shingled roof. The school of today is very different than the first log building of which everyone was proud. The early school had a three month term with three terms in a year while now we have one term of nine months. The early enrolments did average 35 or more. In the present year there are twenty four. A man teacher was usually hired for the winter months as it was thought he could manage the older boys who came when work was slack on the farms. He received more than twice the salary than that of the woman. A teacher was considered fortunate if she taught three terms in one school year. At the beginning the teacher boarded around staying one week at each pupil's home. Thus she received a small salary and her board. In the old building children sat on benches arranged around the room against the wall while in the present building there were double seats arranged in rows fastened to the floor. Later, single seats took the place of the double seats, theses seats were later made movable by fastening them to boards. In the log building there were no electric lights. They used kerosene lamps with reflectors, and if they had a party or program the families brought kerosene lanterns to light the room. The electric lights, a great improvement, was installed February 1929. A large "Round Oak," stove stood in the center of the room of the first building and held the same place in the new school until the spring of 1936 when a "Round Oak' furnace took the place of the stove which had so faithfully served its term. The furnace was placed in the southwest corner of the school. A six foot platform was built in front of the room with a movable two foot platform to use for programs. When a new floor was put in in August 1937, the two foot platform was made stationery. Some things we now have are water cooler which we got in 1909, a clock in 1910, maps and case 1914, piano in 1928, pump in 1927, flag and pole in 1927, sand table in 1929, dictionary in 1937, and a globe in 1937. In 1939 a cement floor was put in the woodshed. Some early entertainments were Christmas Program, bees and Holloween parties. 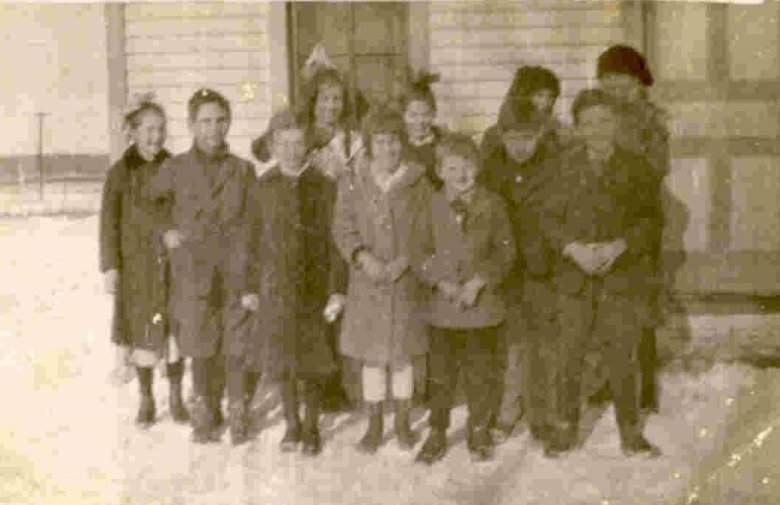 The year of 1906 Ila Hendershot gave her Christmas program where Coles now live. Perople brought in their sleds, lanterns to see by. The Detroit Hillsdale, and Ypsilanti Railroad was run through May 26, 1870. Later the Toledo, Ann Arbor and Grand Trunk Railroad was run through in 1880. The Detroit, Hillsdale, and Ypsilanti Railroad was built by subscribed stocks held by the citizens and the city stock was sold to Mr. Taylor of New York City. The objected so Taylor brought suit in the United States court and judgement was taken for three years interest. The fourth and fifth years' interest was paid voluntarily. The common Council demanded that the Railroad Company give credit for $19,500 stock. This runs in the back of school yard. In 1881 Michigan Central Corporation purchased the road with the intention of adding it to its other system. In the valley and running almost parallel with the Huron River is the Michigan Central Railroad. At the point opposite the Chubb Road is the crossing of the Ann Arbor, Toledo, Grand Trunk Railroad where a bridge was built in 1880. The railroad was completed in 1878. In 1860 the expenses for the entire school year were $210 for eight and one half months of school. In 1865, $125 was raised for fuel and incidental expenses. In 1883 at the annual school meeting it was voted to have nine months of school and to have spelling once a day in classes. John Kock was the director at that time. In 1863 the total expenditures were only $133.56. The teacher received $106 of this. The first record of the teachers that we have been able to obtain is in the year of 1856. Howard Sheldon having taught four months in the winter term receiving $20 per month and Eliza McGraw teaching three months at $8 per month having in all seven months of school. Some early settlers of our community were Langford Sutherland who was born in Ontario County New York in 1802. In 1832 he came to Pittsfield and homesteaded a piece of land which when the school was built was across the road from it. To this family eight children were born. Daniel Sutherland a son of Langford and Lydia was born in Ontario county, New York in 1830 and moved with his family to Washtenaw County. Tobias Sutherland another son of Langford and Lydia was born in 1842 in this district. He married Josephine Knouse. 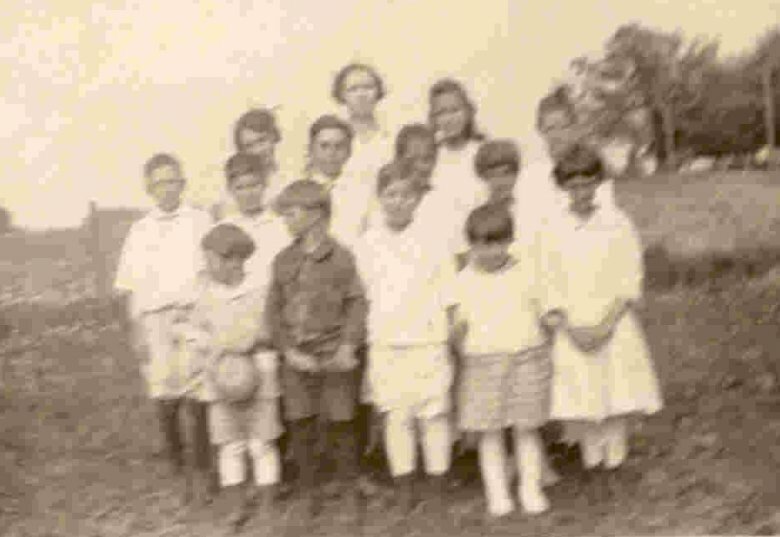 To this family were born two children - Ernest Sutherland who lives on part of the original homestead 1/8 mile east of the school, and Bessie who married Mr. Everrett and later Mr. Lucking is living in Ypsilanti. Another prominent and respected early pioneer of Pittsfield township is David Cody who was born in Oswego County New York in 1820: In 1833 moved to Washtenaw County with his father and lived on the land part of which is now occupied by Mrs. William Cody and her sons Grant and Charles. Samuel D. McDowell was one of the two first located in Pittsfield Township. He was a native of Chemung, Chemung County New York and arrived at Detroit in April 1824. He was located South West one fourth of section two. The second child born in the neighborhood was their son who erected the first barn that was raised in Pittsfield Township without the aid of Whisky. Arba Hurd located on Section 19, in 1831 and was one of the first to come to this district. He put up a log house with places sawed for doors and windows but blankets served as such. Elijale Lathrop came from Lebanon Connecticut September 28, 1832 and settled on Section 18 of Pittsfield where he spent the rest of his life. William W. Harwood was born in Berkshire County, Massachusetts March 20, 1785 of Schotch English discent. When four years old moved with parents to New York receiving a common school education. In 1824 emigrated to Washtenaw County locating at Ypsilanti where with Mark Norris started on the Huron River the first grist mill. In 1836 he came to Pittsfield and engaged in farming and stock raising. By first wife Sally Aldrich, his children were Isaiah, Sarah Mabel and Hannah. In 1825 he married Abigail Albro who died in 1828. In 1830 he married Alma Coe to this family were born six children. In 1839 he married Mrs. Polly Holden and to them were born six children, Harrison, Sydney, and John still living in 1891, but deceased now. Mr. Harwood died in 1860. Sydney Harwood, son of William and Polly attended State Normal at Ypsilanti. 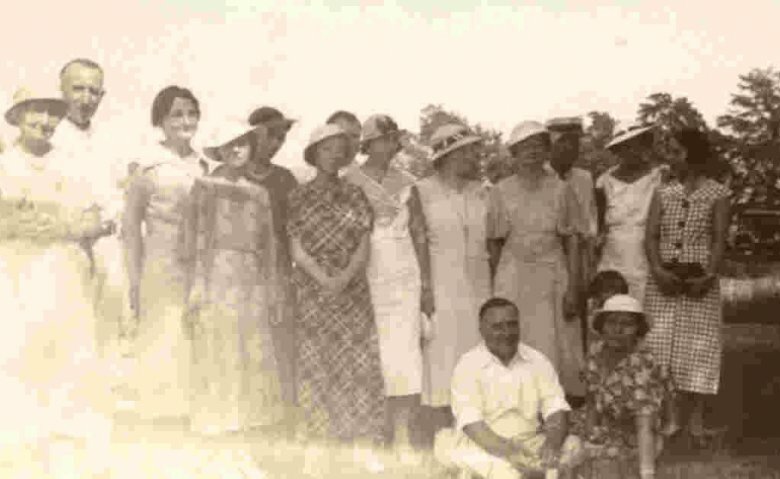 He lived on the two hundred ten acres homestead of his father's raising stock and farming located on U. S. 112. He had two sons, one daughter - only one William H. Harwood living. 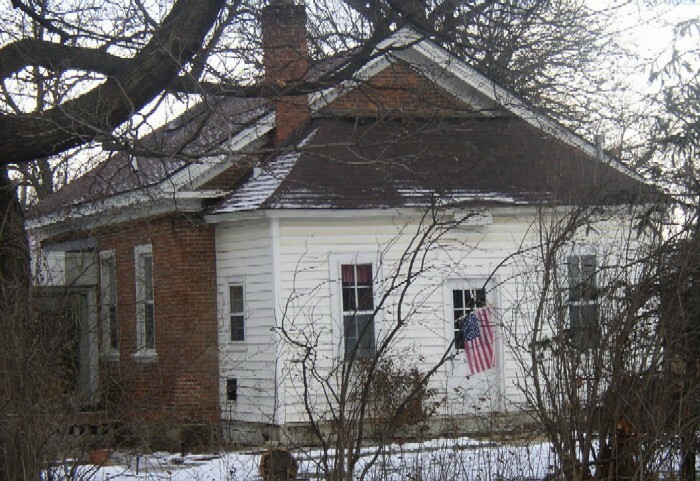 William when a young man bought the Harwood farm which is located on Textile Road and his son Webb is now living on his grandfather's the old homestead on U. S. 112. Source: Pittsfield Township records, box 1, Bentley Historical Library, University of Michigan. This entry is from a history of Washtenaw County Schools written by students in the schools and loaned to the Bentley Historical Library by Julius W. Haab, County Superintendent, August 1943. It has been edited slightly for inclusion on the Pittsfield Township Historical Society Website. For anecdotes about Sutherland School, and student life there, please see: Harold and Mary Wilson and Ernestine Wilson Meenan under Oral Histories.